I just finished reading John Koblas great book titled “The Great Cole Younger and Frank James Historical Wild West Show.” A lot of this book describes how Frank and Cole, the remaining members of the James Younger gang tried to run a clean, ethical, historical show. However, the managers and owners had other ideas. The show was followed by a large group of grifters, gamblers, con men, and swindlers. Frank was often approached by the local sheriffs with complaints. It got to the point that Frank started to wire mayors and lawmen in the towns they were going to visit to beware of this crowd. As a result, after a brief scuffle, many of this bad element were rousted out of town or arrested. This really upset the managers and owners of the show who approached Frank with their thugs. At one point guns were drawn. 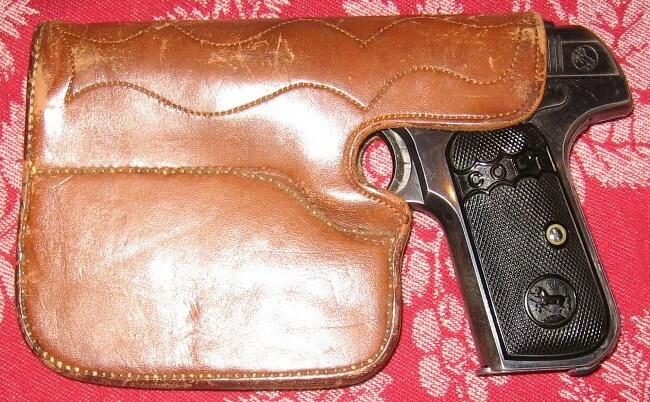 Frank leveled his Luskard, S&W .38 at the men with steel in his eyes. As the ruffians looked down the barrel of the elder James silver plated, mother of pear stocked revolver- they backed down. The owners plotted to assassinate the uncooperative James. On at least two occasions they confronted him when alone, luckily Cole Younger showed up in the nick of time at each occasion with his S&W double action .38. Friends on both sides calmed things down and I guess the “bad guys” still thought there was enough fire in the two old guerrillas not to open fire. As a result, both James and Younger went about always armed. One of Cole’s last statements to the owners was “I will drop any man that touches Frank.” Soon both James and Younger notified the show that they were leaving at which guns were drawn again. After this the two last James Younger gang members continued to tour alone with one lecture group or another, careful never to go into Minnesota who threatened to revoke Cole’s parole, or to bring charges against Frank for the Northfield robbery. 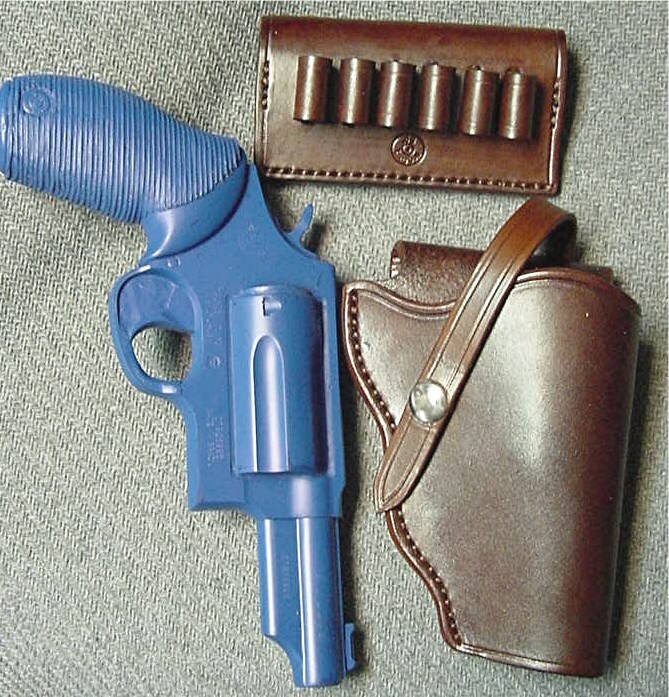 Taurus makes one great defense or offense pistol with a 2 1/2″ or 3″ five round cylinder for .410 buckshot magnum shells as well as hot 45 Long Colt cartridges. 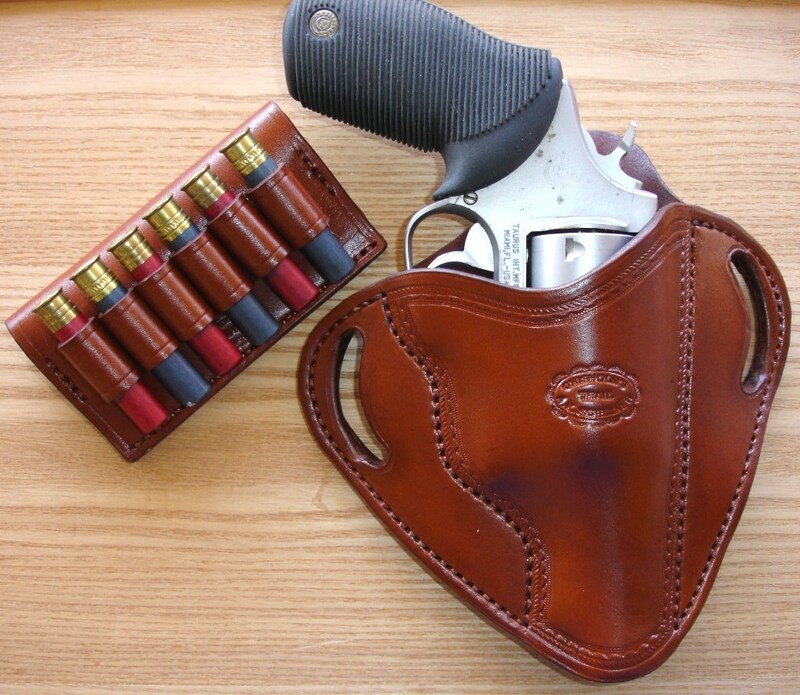 Our over the belt field holster is great for hiking, hunting, or general outdoors use. A heavy gun like this needs a well thought out, strong holster with retention strap if needed. After a period of testing, our prototype is ready to go. We use heavy 9-10 gauge tooling leather and wet form it to the Judge. Your choice of colors. Edge groove, Without retention strap ~ $99.95. With one line of edge stamping ~ $109.95. With full coverage like basket weave or flowers & vines~ $134.95. For lining add $25. For snap or Sam Browne stud strap add $10. Six shot belt slide available below. Please specify cylinder and barrel length when ordering. 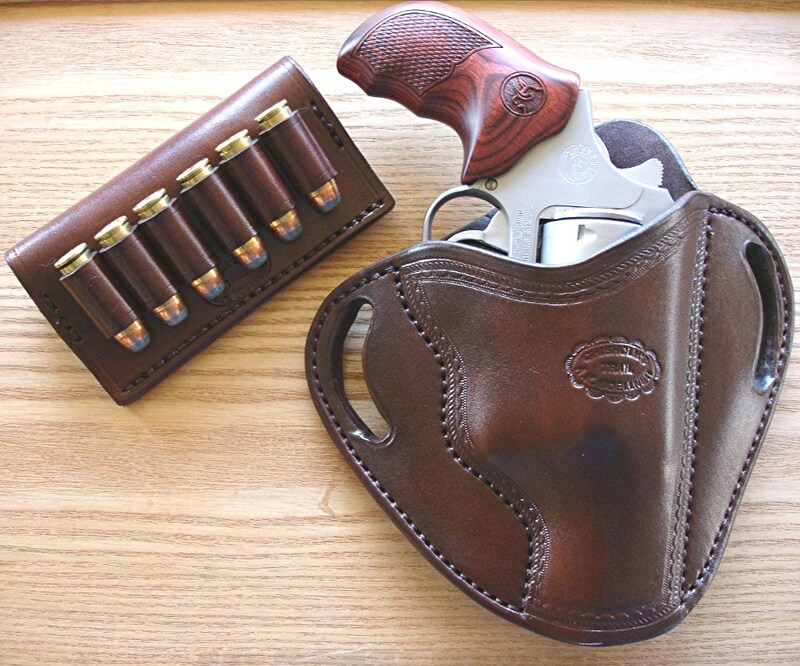 New belt slide Taurus Judge holster with 1 1/2″ or 1 3/4″ slots for your belt. We use heavy 9-10 gauge tooling leather and wet form it to the Judge. Your choice of colors. Edge groove, Without retention strap ~ $89.95. With one line of edge stamping ~ $99.95. With full coverage like basket weave or flowers & vines~ $124.95.For lining add $25. Two sizes- 2 1/2″ cylinder or 3″ cylinder for .410 MAG. 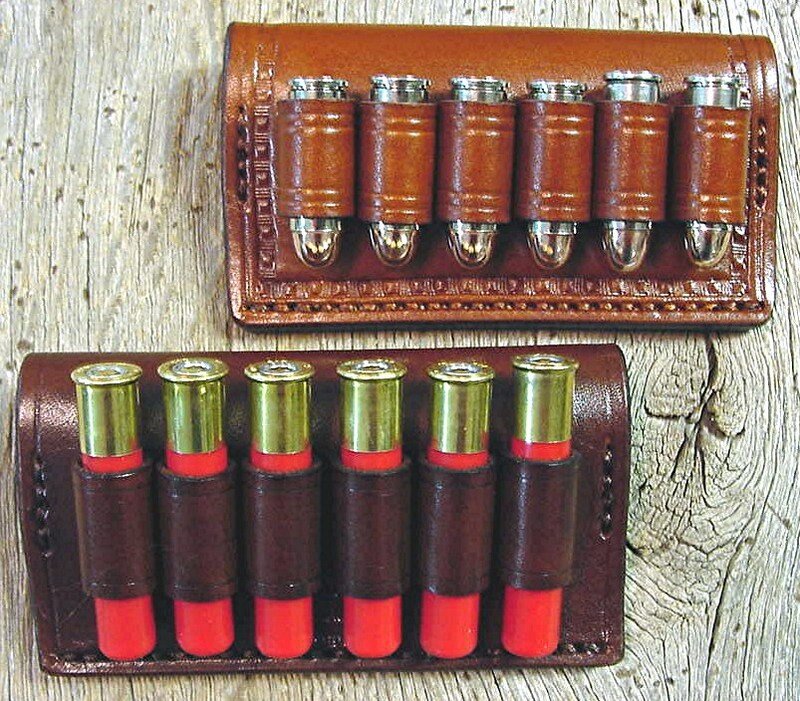 Six shot belt slide available below.